M2 Money Supply, the broadest measure of the money supply in Norway, plunged 1.29% in September on previous month according to data released by Statistics Norway. Though it was the biggest month on month drop since August 2012, it is not unusual that the money supply fluctuates considerable on a monthly basis. The M2 expanded 4.06% compared to the same month last year, slightly below the 12 month average of 4.25% and 3.13 percentage points (77.12%) lower than the 7.19% average since December 1996. 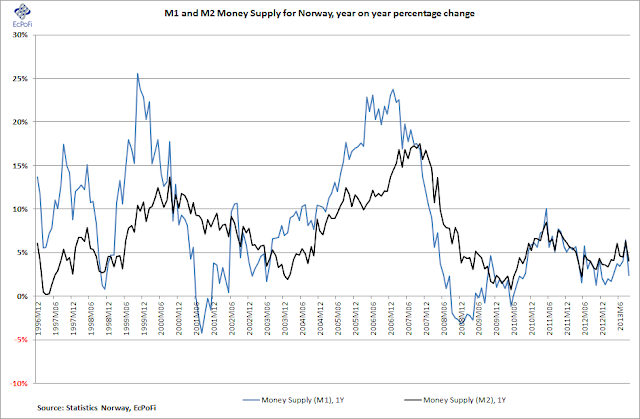 The total M2 money supply stood at NOK 1.81 trillion at the end of September. 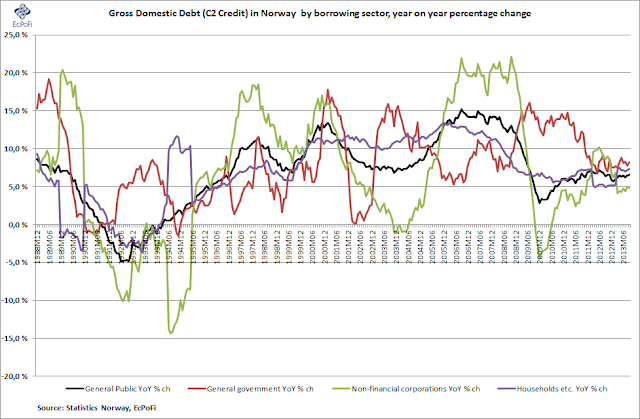 Gross Domestic Debt (C2 credit) for the General Public in Norway, which consists of General Government, Households and Non-Financial Corporations, expanded 0.60% on August to end September on just over NOK 4.30 trillion. Compared to September last year, C2 credit increased by 6.55% and recorded its biggest year on year (YoY) increase since November last year. The growth rate was 28 basis points higher than the 6.27% year to date average. Debt for the General Government continued to expand rapidly increasing 8.22% on September last year, slightly higher than the 8.00% average for this year. The YoY growth rate for Household debt increased in September from 7.14% in August to 7.30%. 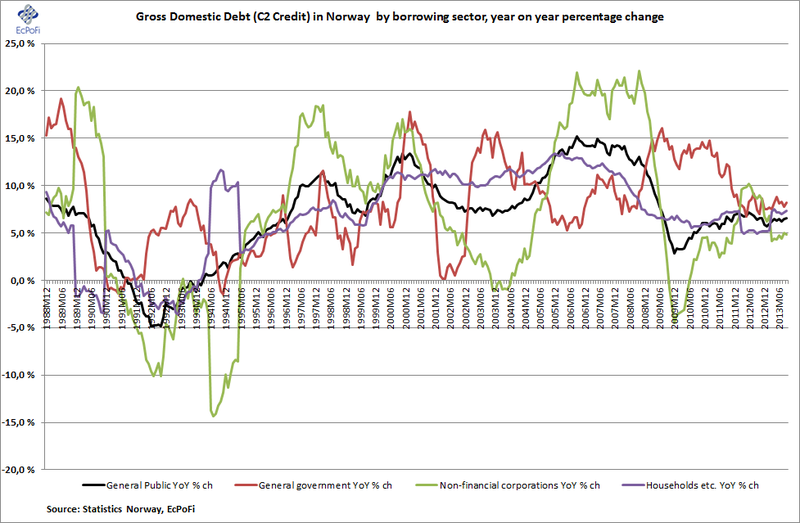 Though it has remained fairly stable in the 4.40% to 5.00% range during the last four months, debt growth for Non-Financial corporations has declined significantly compared to the 8.63% YoY average growth in 2012. Looking at the sources of C2 credit, Bank Credit made up 47.9% of the total in September. Notably, at 3.6%, the YoY growth rate was the highest recorded since the onset of the "financial crisis" in 2008, having averaged a negative 1.2% since January 2009. There were two other interesting observations based on the September statistics: 1) the YoY growth rate in lending from Mortgage Companies fell to 5.6%, the lowest reported since November 2006 and 2) Bond Debt increased a staggering 31.6%. The former, making up 33.0% of total lending in September, could very well help explain the drop in house prices reported for October today (here, in Norwegian). Conversely, the tremendous growth rate in lending from mortgage companies, having expanded 35.7% on average every month on a YoY basis between 2008 and 2012, has helped fuel the boom in house prices in recent years (e.g. here). If the growth rate in lending continues heading downward, and if banks and other lending institutions do not compensate for this drop, this will likely lead to house prices continuing to drop going forward as well. 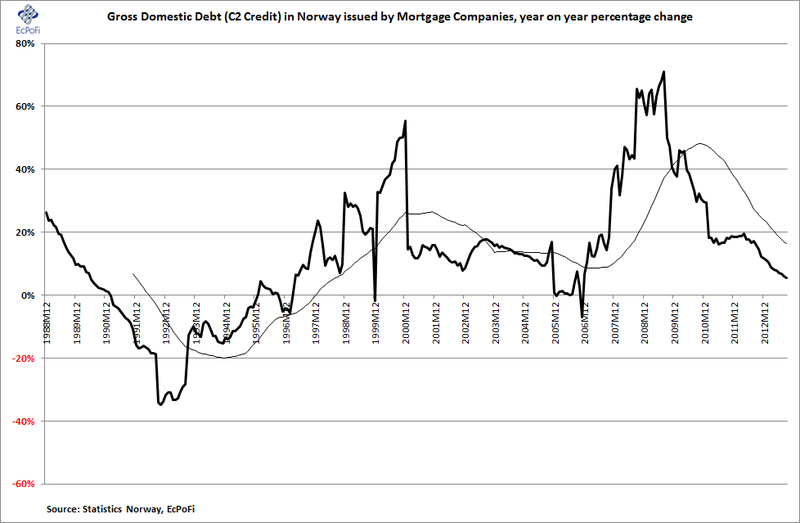 This is a likely outcome as surging house prices in Norway have been a direct result of historically low interest rates and rocketing credit growth - a classic credit-fueled housing bubble in my view as I've written about on numerous occasions during the last year or so (here). Let me here emphasise that additional credit growth is not a cure for falling house prices as all it does is postpone a necessary correction to more sensible house prices not driven by artificially low interest rates and credit expansion not backed by a commensurate amount of previous savings. Norwegians are already more than indebted (here), unsustainably so. 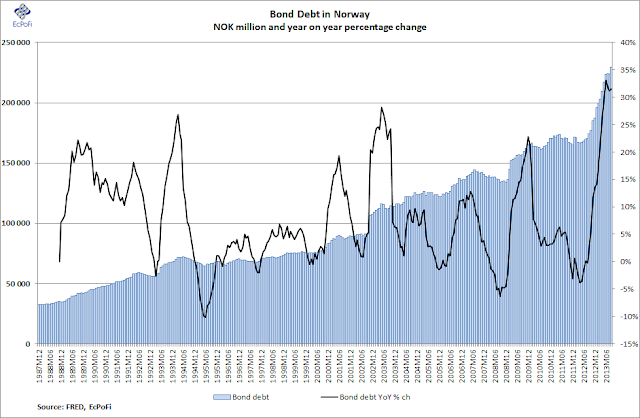 As for the second interesting observation this month, Bond Debt recorded a new all-time high and has now expanded 22.54% this year, from NOK 187.33 billion in December 2012 to the current NOK 229.55 billion. As a result, its share of total C2 credit has increased from 4.3% at the end of last year to the current 11.9%. Such aggressive growth should not go noticed without issuing a cause for concern, especially as it is likely driven by the low level of interest rates in Norway and as a result investors reach for yields. Finally, credit issued by State Lending Institutions has grown at about 6.0% on a YoY basis during the last two months.